I'm working with a new client, and it's been very fun. One of the first things I did when I took over their Instagram account is archive ALL their old content. Why? Because there was no rhyme or reason in the posting of images, no editing of photos and no general color theme. Sometimes it works that you can work without these things, but in this case, it didn't. Their engagement was non-existent and the images that were shared did not tell a story about the business. Social Media Short: you can seemingly 'delete' photos from your Instagram feed by archiving them. This is good if you want to play around with your theme, test a new posting strategy, or just don't like what you had posted way back when. To do this, on the upper right side of the image select the three dots, and then from the drop-down menu, select archive. After spending some time in my clients' shop (it's a home decor/gift shop) arranging, styling and photographing product, I've spent the last week uploading images on a consistent schedule on both Instagram and Facebook and we've seen a noticeable jump in engagement, likes, and followers. Such a great feeling and the client is thrilled! Selecting a color theme can be difficult and frustrating. When I'm hired to revamp a blog or social media channel, the first thing I do is study what they sell, taking into account the predominant colors they use and any company colors, logo designs, etc. I'm very visual, so I usually know what look I'm going for pretty quickly, and design content uploads to reflect this, scattering in some other content that fits within the scheme. There are quite a few websites out there to help you decide a color theme if that's not your thing. Of course, Pantone is the industry standard, and they have handy chip books and color guides you can purchase to help you get started. Many paint brands also have fan guides and you can sometimes get them for free from the retailers (however, I don't think they're doing this all that much anymore). A trip to Home Depot, Lowe's or any other home improvement store that sells paint is also a great place to start. Take a look at the paint chips, and many of them have some complimentary colors that can help you decide on a color theme. It's fun to grab a few ideas and play around with them later. One resource I love is Design Seeds, a fantastic website of user-generated images that are paired with the real color codes so you select the actual color when designing in Photoshop, or any other image editing program. One of my favorite color combinations are blues and neutrals, and this palette is perfection. This particular palette is called Color Wander - see it all here. If you are a color addict (like me!) take a look at Design Seeds for major inspiration! Happy July 4th! It's truly the season of outdoor living, barbecues and entertaining and we've been working to spruce up our backyard to make it more inviting and a place we actually want to hang out in! We've lived in our current home for 18 years, and over time, our backyard has been through a few refurbishments. None of them big until this past fall, when we decided a major overhaul was necessary. My husband & I have gone back and forth on what our goals for the space were, and we had some major differences to work out. He wanted a lawn, while I wanted to go drought tolerant and low maintenance. Considering the size of most Southern California yards, ours is large by most standards. We live on a street that curves uphill at the side of our property, so we have one of the largest lots in our neighborhood, just under 10,000 square feet, which affords us a nice sized backyard and a bit of side yard. The previous owner had put in a large cement patio which would be a fortune to rip out, so we've had to work with it. I'm in love with the idea of "garden rooms", where there are different areas and spaces for entertaining or chasing the shade on a lazy day. Since I've been dreaming of a beautiful backyard space for years, I set up a Pinterest board long ago that has since come in very handy. A few of my favorites that I used to draw inspiration from are below. 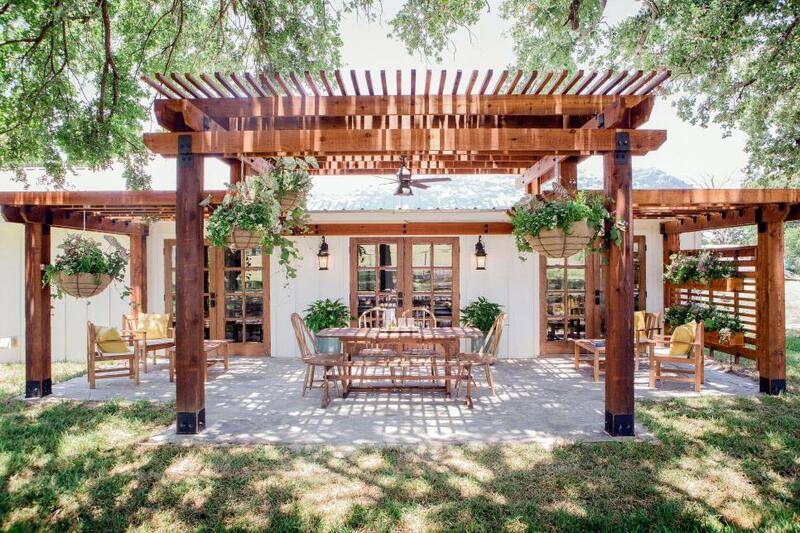 I love the idea of a Pergola, and this space designed by Chip & Joanna Gaines is beautifully laid out with separate conversation areas as well as dining. This is so simple & organic, and I love the natural elements. It isn't clear how much sun this space would get, but in the evening it would be a lovely place to entertain, especially with the string of lights and a few well placed lanterns. 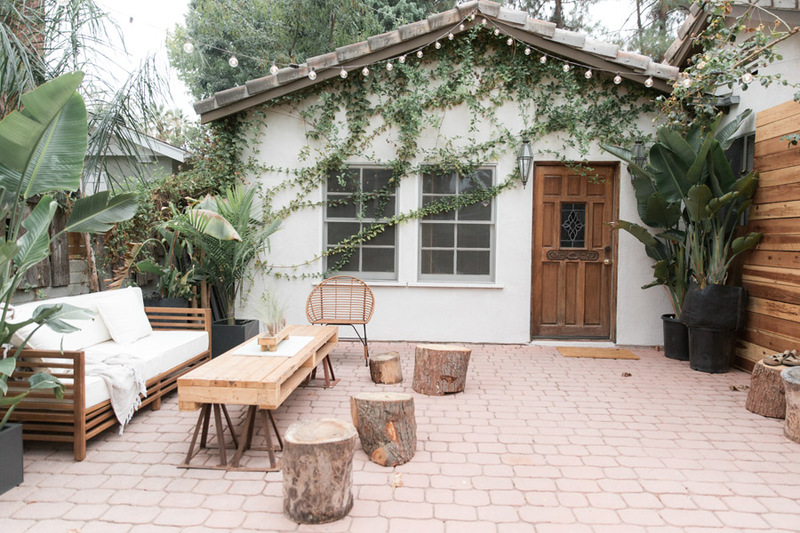 I'm super into this natural and boho design, and love that they didn't need a lawn to create a beautiful outdoor area. Gorgeousness aside, and as simple as it looks, those leather chairs and cloth poufs would need to be brought inside every night, especially here on the coast where the fog rolls in almost nightly. This is probably one of my favorite backyard redesigns. I like that they did the majority of the work themselves (we're huge DIYers) and worked with what they had in terms of size, climate and grass area. I love the pergola (which isn't in the cards for us) and the cute separate conversation areas. I probably got the most inspiration from this, adapting our space to fit our needs and budget. Today we will have a simple barbecue with a few people and I'm looking forward to using our new space fully. I'll try to snap some photos when everything is set and share a little before and after so you can see the progression. Enjoy your holiday and stay safe! It’s been ages since I did a Book Club post, and while I’ve been reading regularly, there hasn’t been a book that has moved me until recently. Self Portrait with Boy is the debut novel by Rachel Lyon, and it isn’t a masterpiece by any means. The writing is good, maybe a bit disjointed, but it was the moral dilemma presented in the book that has been on my mind. The story centers on Lu Rile, a struggling (in every sense of the word) artist in New York City, set sometime in the early 1990’s. She lives in an illegal loft populated by other artists and works three minimum wage jobs to support herself, and help her ailing father with his upcoming cataract surgery. Her medium is photography, and she is working on a daily self-portrait project on the day the novel opens. She is at day #400, and as she is sitting in her loft, she notices the light coming in through the windows and the seagulls swirling outside. She sets up her tripod, undresses and practices jumping through the air aiming to time the shutter release at the precise moment she arcs in her jump. Finally, she is successful, and moments later hears a commotion in the stairwell as neighbors who were having a party on the top floor and their guests rush downstairs. She is oblivious and takes the stairs up to the roof, where she discovers that the young son of her neighbors had fallen to his death minutes earlier. When she develops the slide, it is everything she thought it would be – beautifully composed, perfectly centered and balanced, but there is an image that she can’t identify in a corner that propels her to develop a print. That image is the boy falling, and it elevates the entire image to a masterpiece of composition; her jumping through the air at the perfect arc and the boy falling in juxtaposition to that jump. Both jumps, in opposite directions (for the record, it is never clear if the boy actually jumps or has tripped & fallen) are stunningly beautiful and equally haunting. Have you ever played tourist in your own town? Probably not, but it’s a super cheap and easy way to spend a beautiful day outside. Yesterday we drove down to 22nd Landing at the Port of Los Angeles, where they have a Metro Bike LA Station next to our favorite brewery, Brouwerij West. A one-day pass is $7.00 (trips less than 30 minutes are only $3.50), all you have to do is download the app, create an account, enter payment information, and then follow the prompts on the kiosk and choose your bike. There isn’t a lot of traffic in that area, plus it was Sunday, but we simply crossed the street and rode into the Cabrillo Marina for a little sightseeing and easy exercise. There was just the slightest chill in the air but the wind was blowing against us so that definitely added to the work of the ride. It was such a gorgeous day, the sky was the bluest blue, with just a few clouds it was a perfect Sunday afternoon. Just past the marina is a large empty parking lot where motorcycle enthusiasts gather to ride and show off some shenanigans – there was a group of Mongrel Motorcycle Club members, and we watched one of them pop a wheelie, definitely a production because those bikes are large & heavy! A little further down the road, you can find the SS Lane Victory, which has self-guided tours daily and actually has a pretty interesting history. It was built in 1945 here in Los Angeles and served in World War II, the Korean War & Vietnam War, as well as part of a merchant fleet. You can continue down the road (north, I believe) and hit Ports O’Call Village and eventually the LA Waterfront Park. We did not continue down yesterday, but did this same ride last month on a warmer day and rode to the Waterfront Park and back. It’s a great ride, but Ports O’Call has certainly seen better days and really not worth stopping at. Instead, we headed back toward the Metro Bike Station and rode through a 22nd Street Park, which is right next to the station. Visit Metro Bike LA for details. There is a map with locations (see below), mostly in metropolitan areas. I think it would fun to do this in Venice and Pasadena too, but I’d be wary of Downtown LA due to traffic. Download the app, create an account and load your payment information. Bring a backpack or crossbody bag, you don’t want your camera, phone or wallet falling out of your pocket, and while the bikes do have baskets, there are large gaps and small items will fall through. Bring water, money and a lock if you plan to stop for a bite or a beer. Watch the traffic, they might not be watching you!